The Mountain Massif Dyngjufjoll in the southern Odadahraun lava area has an area of about 600 km². The Dyngjufjalla Valley divides its westernmost part, the 20 km long mountain range Dyngjufjoll ytri, from the main massif. The main massif surrounds a 50 miles square caldera called Askja. The mountains are steep and indented with gullies and gorges. Their structure is mainly hyaloclastite with a few small rhyolite intrusions and Holocene lava fields. The area is almost devoid of vegetation and water is scarce because of the permeability. The greatest historic eruption started in 1875. It devastated the settlements on the moorland Jokuldalsheidi and ashes were traced across the northern part of continental Europe. The crater Viti did not emit these enormous clouds of ashes, but craters that disappeared when Lake Oskjuvatn was created. The crater Viti probably only emitted boiling mud and a small volume of ashes. Many other historic eruptions in this area are recorded, such as the 1921 Batshraun eruption, the 1922 Myvetninga Lava eruption, the 1922-23 eruption, which created the lava fields Kvislahraun and Sudurbotnahraun, the 1926 eruption, which left a small island in Lake Oskjuvatn, the 1926-30 eruption (Thorvaldshraun), and the 1961 eruption, which created the Vikra Lava. The Lava Ridge Dyngjuhals stretches to the north from the western part of the glacier tongue Dyngjujokull. 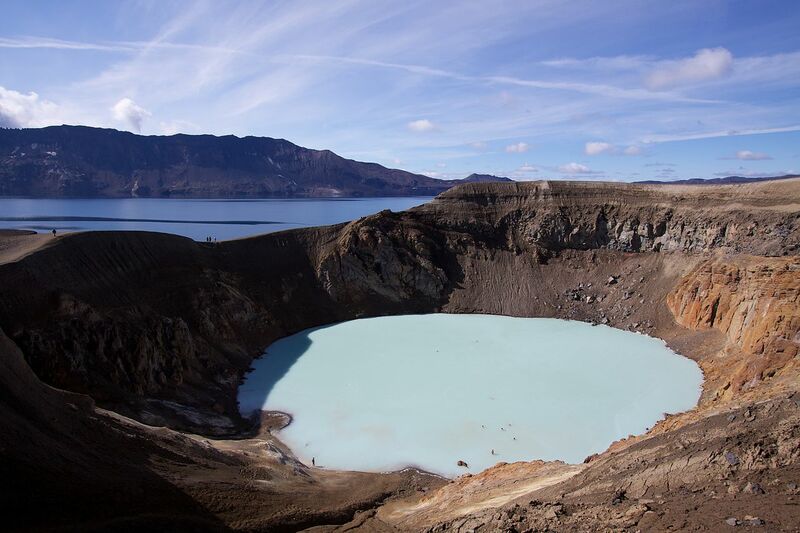 It is dotted with the craters of five crater rows, which lie side by side and make this small area the most volcanically scorched in the country. Those crater rows were created by fissure eruptions, which were 5-10 km long south of the shield volcano Trolladyngja, and continued north of it. The lava fields created during those eruptions can be traced south into the Vonarskard Pass and to the north along River Skjalfandafljot. The Caldera Grimsvotn situated under the western part of the icecap Vatnajokull and is thus ice filled. Its greatest depth is about 600 metres and its area is close to 40 kilometres square. It has been very volcanically active during historic times, and the latest eruptions took place in 1996 and 1998. Eldgja, the 40 km long fire fissure, was created during one of the largest eruptions on earth around 930 (Gudrun Larsen). The Katla volcano probably is a part of the same system further south. It has erupted at least 20 times during historic times. Katla is one of the largest calderas of the country, 700 metres deep and 110 kilometres square. Tephra and water can rush from the volcanic areas through the so-called Entugja gorge down to the outwash plain Markarfljotsaurar, down under the Solheimajokull glacier tongue as well as down the Myrdal’s sander outwash plain. Katla has only produced lahar floods up to 1 km³ in size. The magma chamber under the volcano is estimated at the depth of 1-1½ kilometres. Its highest part therefore might lie above sea level, which makes it the shallowest one in the country. It contains 30-40 km³ of magma. The Thjorsa Lava Field was created about 7800 years ago. Its volume is close to 21 km³ and its area about 920 km², which makes it the largest lava field created during the last 10 thousand years. It ran from craters in the vicinity of the Heljargja gorge all the way to the sea in the south.